At Sewn Apart, we believe in doing the right thing. We think globally and act locally. SA makes small batch, hand crafted bowties and more by recycling old clothes and found fabric. We do this as a statement about how much we waste as a society, food and otherwise. We believe cotton agriculture is the elephant in the room in the agricultural world – and the clothes we put on our bodies are just as much a part of our lives as the food we eat – both of which come from the same system. 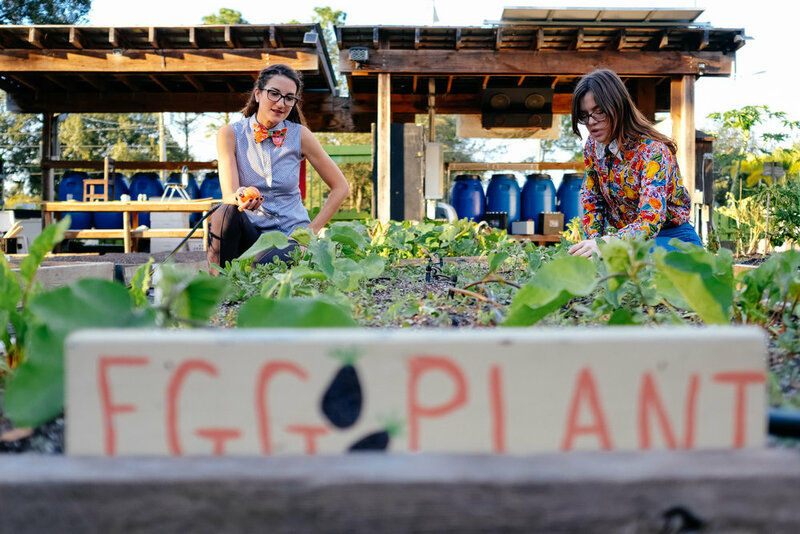 The Sustainable Living Project is a working urban farm and community education center. They grow food on a city lot and teach a sustainable lifestyle utilizing renewable clean energy, aquaponics and traditional growing methods. All healthy foods are donated to those in need and shared with the volunteers and community members. Sewn Apart also volunteers their time and a percentage of sales to growing the farm's community presence. Did you know you can compost fabric? There's so little data on textile waste composting, yet many sources say most fabrics can be composted. Figuring out another way to use our closet rejects is imperative. We cannot continue to turn over our closet at such a rapid rate without having a proper way to 'dispose' of old clothes. Donation centers are getting full. Continuing to donate to developing countries is not a long term solution, either; it's not helping their economy to grow to receive free things, and some countries are starting to ban it because they don't want our rejects anymore. So we have to do something with it! Roughly 84% of unwanted clothing ends up in a landfill, where they decompose and release methane into the atmosphere - much like rotting food in a landfill. Because most fabrics and textiles are natural materials, they can be composted returning some of their embedded energy back into soil. We have found so little data about fabric composting, expect that its possible, so we are going to be holding a few experiments.